There was a whopper of a storm today. “A TERRIFIC storm,” some might say. Tattered tomato plants, the potatoes even worse. Battered squash. Shredded corn leaves. Some carnage. 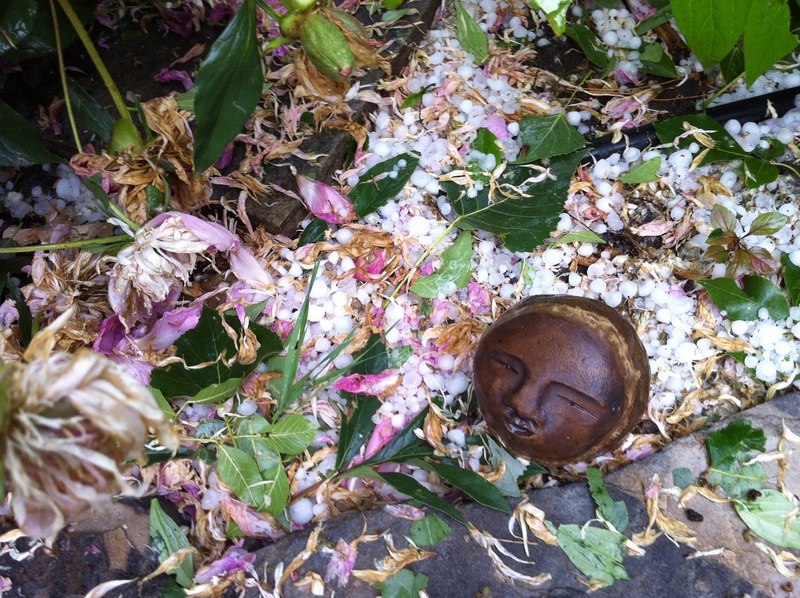 as the garden reeked of decimated dill and mint and onion. 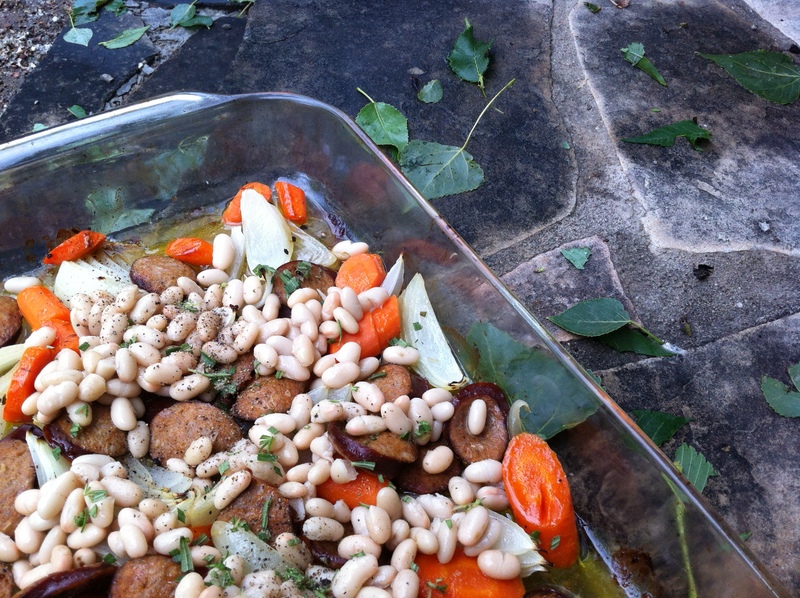 invigorated by the storm, I pulled a can of organic white beans from the pantry, roasted a couple of onions and carrots with a fresh turkey kielbasa drizzled with olive oil and scattered with pepper and rosemary – then feasted. 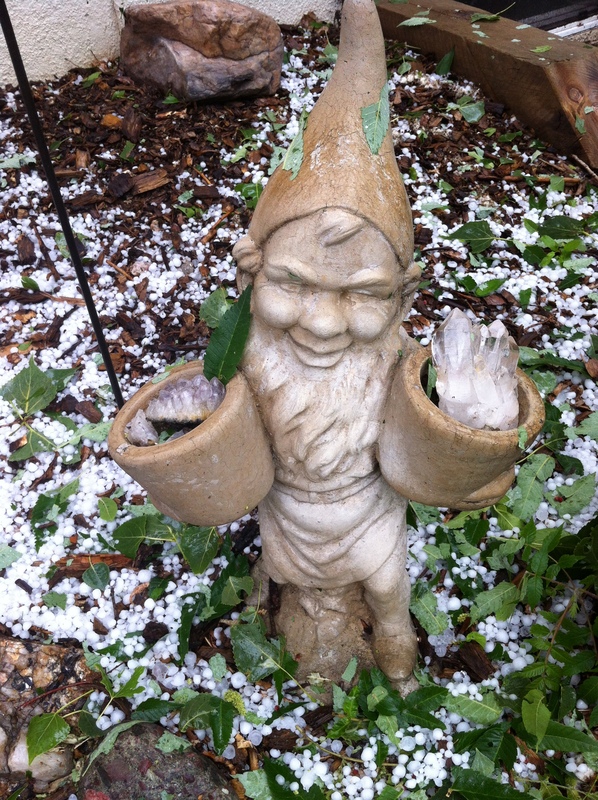 And my old friend the Gnome, stalwart chap that he is, kept smiling through it all. I guess he just can’t help it. God bless him – because the garden truly looks a sight. When life gives you hail, make a bean-sausage soup! I love it. 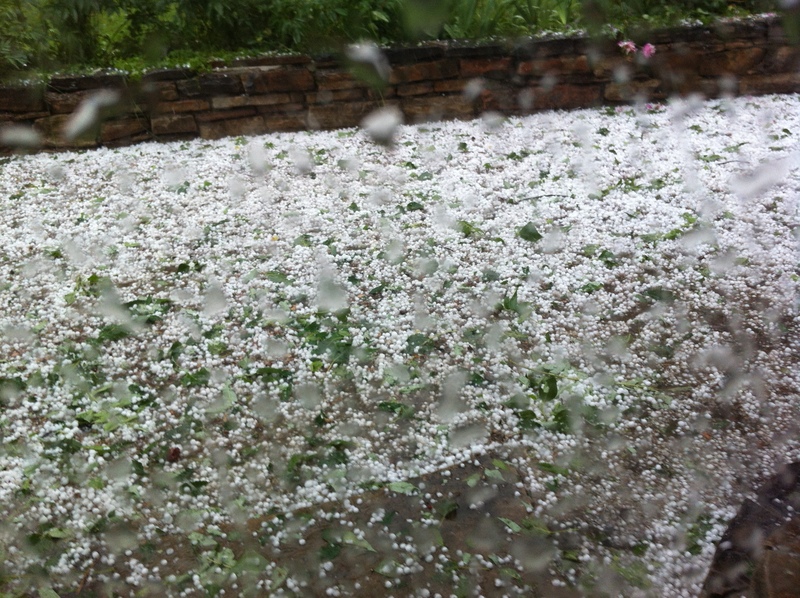 Boy, what a storm…I hope it didn’t destroy all of your veggie plants. 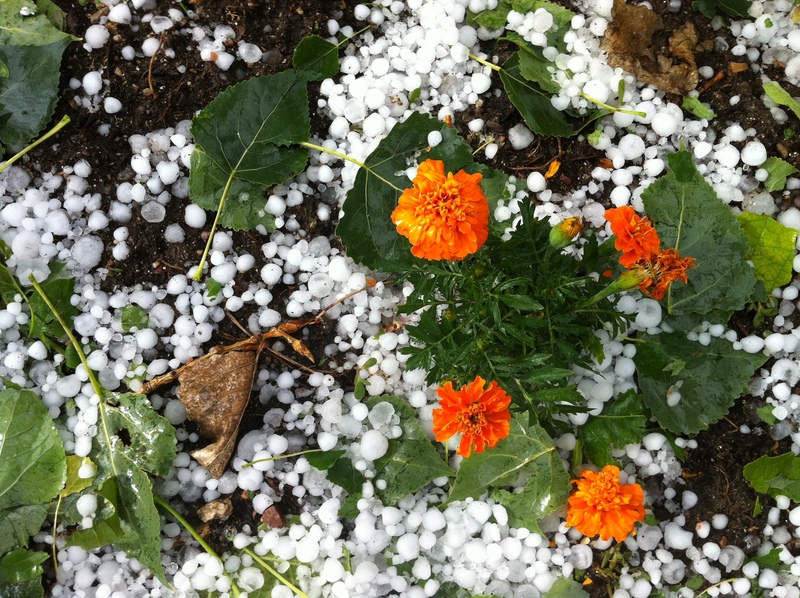 It’s heart-breaking when you put in so much gardening effort for everything to be wiped out by one storm. Thanks so much. 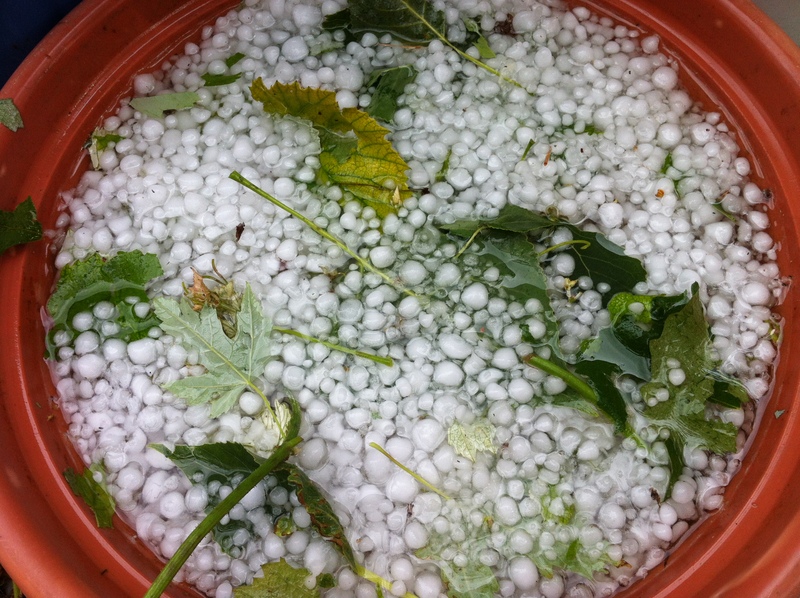 It was quite a storm – I hope people weren’t caught out in it for long – the hail was really pelting down for a good ten or fifteen minutes. Drift of it where it had slid off the garage roof. When we walked out to examine the garden, most all of the centers of the plants are intact. So there is hope! And dinner was delicious!